A simple Mexican green mole, Pipián Verde gets it’s name from using toasted pumpkin seeds to add flavor. 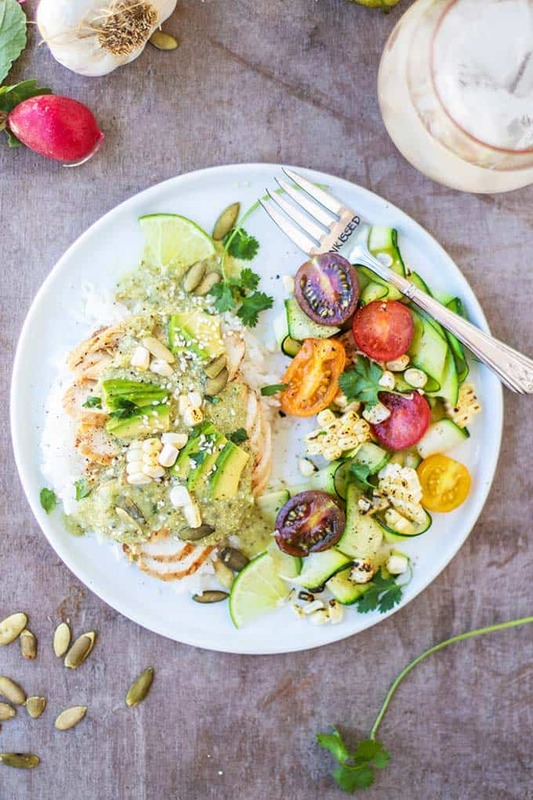 Use this pumpkin seed sauce to drizzle onto meats, as a sauce on tacos or burritos, or as a delicious green enchilada sauce. If you’ve been to Mexico, you know the difference between Tex Mex, and Mexican food. 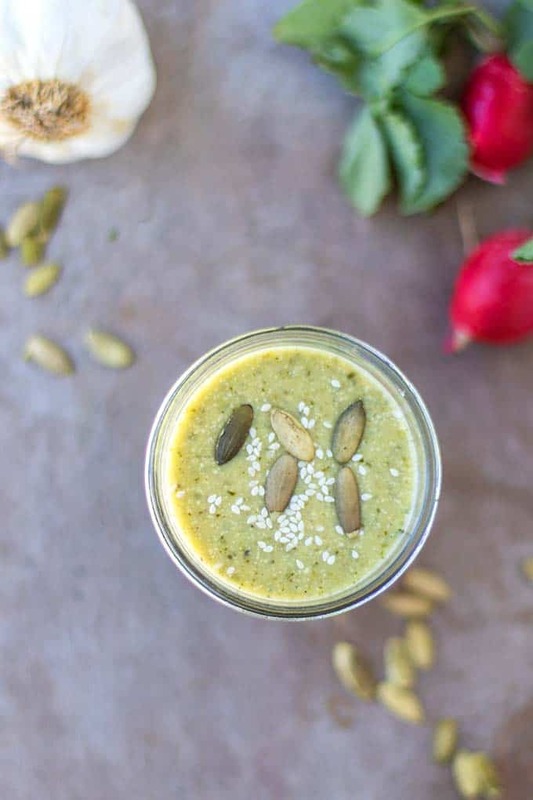 This delicious pumpkin seed sauce is the real deal. Moles are traditional Mexican sauces that typically have ingredient lists a mile long. These sauces can range from black in color, to red, and my personal favorite, green. A black mole is flavored with chocolate, fruit, chiles, nuts or seeds, and lots of spices. 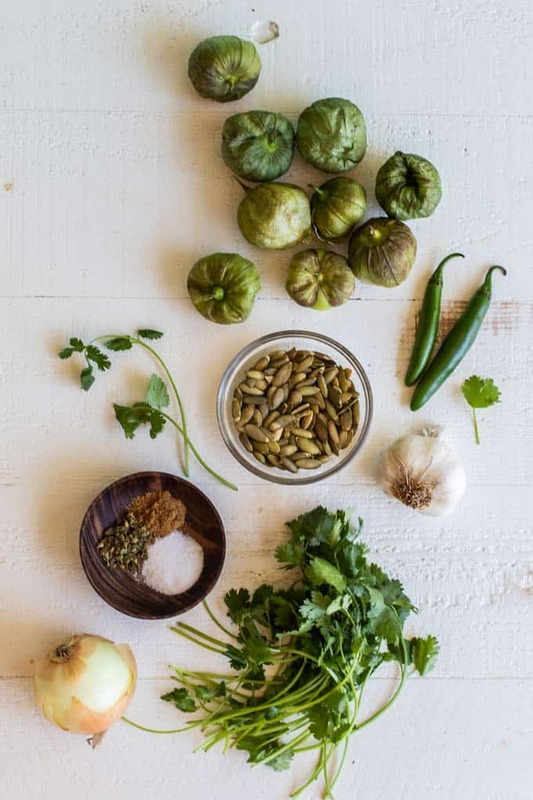 Green moles are made with tomatillos (most of the time), chilis, garlic and onions, and spices. They also usually contain seeds, like sesame seeds or pumpkin seeds. My version of Pipián Verde has a much-shortened ingredient list, so don’t shy away if you’ve been afraid to make moles in the past! How do you Make Green Mole? Traditionally, moles are made by pounding and crushing the chilis and spices down into a paste, and then thinning with broth or water. This process takes a long time, so luckily, we have blenders and food processors in our kitchens now to complete the task in minutes. Toast pumpkin seeds, then set aside. Soften onions, garlic, chilis and tomatillos in a frying pan with olive oil. 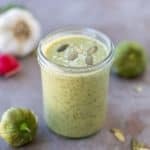 Puree softened vegetables along with pumpkin seeds, spices, and cilantro, and then thin with chicken broth or vegetable broth. It takes about 20 minutes, and while it’s cooking, you can be preparing other parts of your meal. How to Serve Pipián Verde? 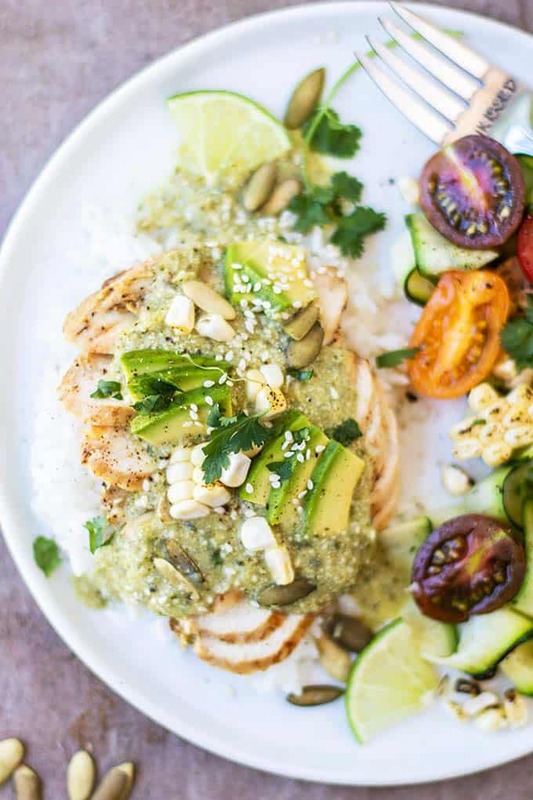 This delicious green sauce can be used similarly to an enchilada sauce. Traditionally, a green mole would be used as a simmer sauce for chicken. I use this for so much more! Simply use this sauce to top grilled chicken, pork or fish, for a super flavorful meal. Use as an enchilada sauce. Add to a crockpot along with chicken or pork for amazing shredded meat, which you can use for tacos, tostados, or just to top salads. Eggs?! I will definitely try it! A traditional Mexican green mole sauce, made with pumpkin seeds. Use this sauce as a topper for grilled meats, in a crockpot, or for enchiladas. This sauce has so much flavor, the rest of your meal can be very simply seasoned! Toast pumpkin seeds in a frying pan over medium heat. Stir occasionally for about 10 minutes, then set aside. 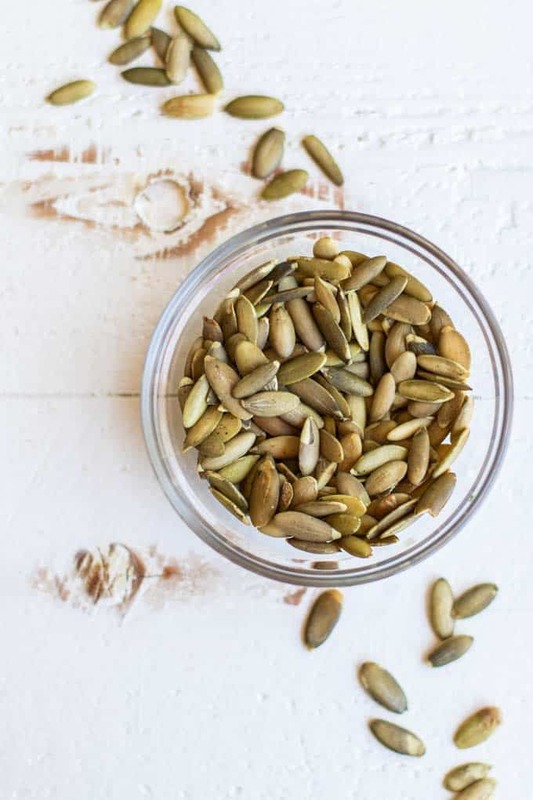 Optionally, toast extra pumpkin seeds to use as a garnish later on. Add tomatillos, garlic, onions, and serrano peppers in the frying pan, along with 1 tablespoon olive oil. Soften the vegetables over medium to medium high heat. This will take about 15 minutes. Flip the vegetables about half way through. NOTE: Serrano peppers can be very spicy. I typically remove the seeds and veins to reduce the heat. You can sub bell peppers if you are very sensitive to heat. 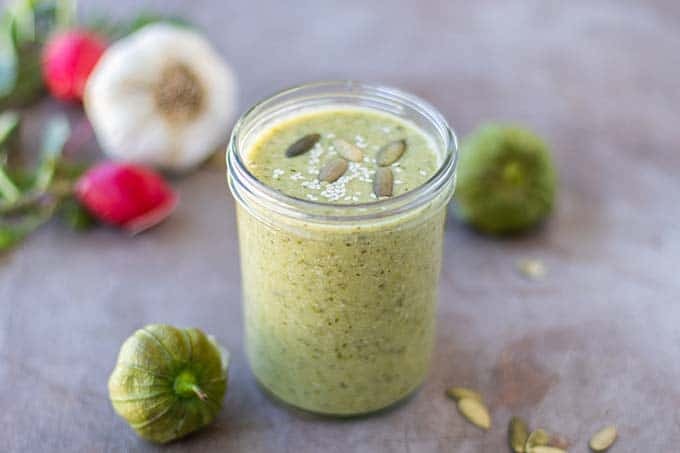 Once the vegetables are softened, add them to a blender along with the spices, pumpkin seeds, and cilantro. Add 1 cup of chicken broth and blend until smooth. Add the 2nd cup of broth, and pulse to combine. Add lime juice, and then adjust salt and seasonings to taste. The sauce should be spicier/saltier than a salsa, since it's meant to season meats or other dishes. *Serrano chilis are often very spicy. I removed the seeds/veins, and ended up with a perfectly spicy sauce. If you are sensitive to heat, you can omit the serranos and use 1/2 a green bell pepper. This Pipián Verde recipe post may contain affiliate links, meaning if you make a purchase, I will receive part of the sale as a comission. This helps me continue to bring you lots of fresh and inspired recipes!